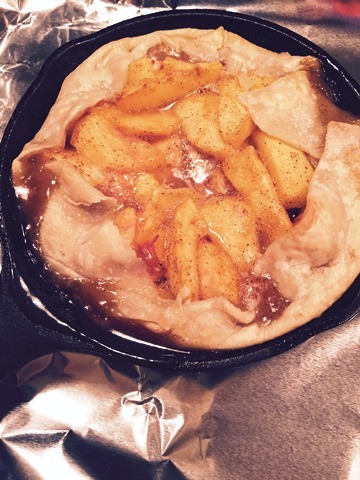 This Bubbling Southern Style Fresh Peach Cobbler Is Perfect For Summer Nights! Summer is in full swing and juicy-sweet fresh peaches are available so I decided to make a delicious Fresh Peach Cobbler. Sweet local peaches are baked in an easy pastry crust and I absolutely LOVE this Fresh Peach Cobbler recipe! I’ve made it in my small cast iron skillets for individual servings and I’ve also made the same recipe as a Freestyle Peach Tart. It is incredible either way! This is the PERFECT ending to any summertime meal. Savor the flavors of summer with sliced fresh peaches that bake in a flaky crust along with cinnamon and sugar…WOW! Top the Fresh Peach Cobbler with a big scoop of vanilla ice cream. When you make this, it’s best to use fresh peaches. Just peel, remove the pits and slice the peaches. 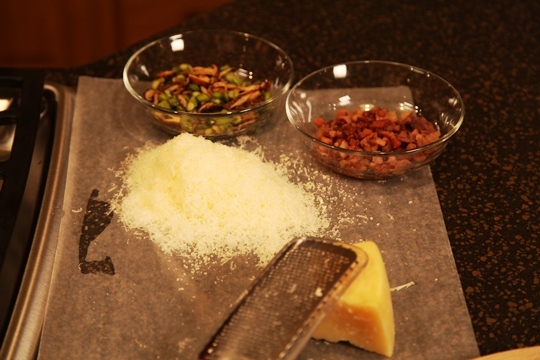 The ready-to-use piecrust makes this recipe super simple! You can have this Fresh Peach Cobbler ready for the oven in less than 15 minutes! Savor the flavors of summer with this Fresh Peach Cobbler! Spray the individual skillets with cooking spray. 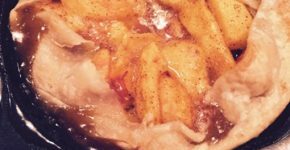 Place one pie crust in each individual skillet. Mix sugar and cinnamon; add 1 tablespoon of the cream cheese to this mixture. Spread on each crust. Reserve 1 tablespoon of the sugar mixture. 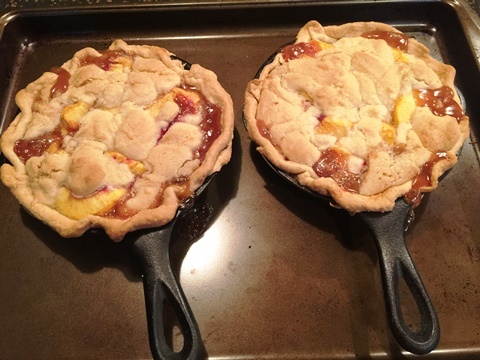 Toss the peaches with the remaining sugar mixture; spoon into the individual pie crusts. Sprinkle each cobbler with the remaining sugar mixture. Bake 25 minutes or until the crust is golden brown and the fruit juices are bubbly. 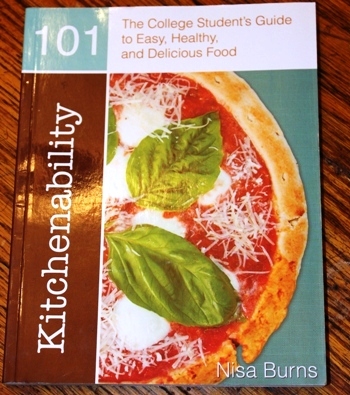 Kitchenability 101 by Nisa Burns is a fantastic cookbook geared towards college students. But, I think it would be well received by any child who likes to cook or the novice chef looking for a great introductory book. What’s so great about the cookbook? For starters, ever single recipe has a full color photograph which makes it excellent for someone starting out in the kitchen. 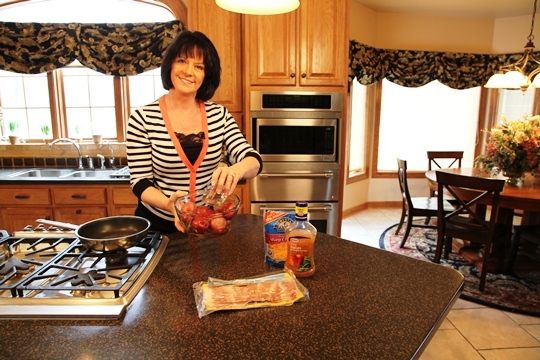 It also gives an excellent tutorial that walks the reader thru a basic kitchen, the appliances, the techniques needed to prepare a meal, cooking terminology, staple items to keep on hand, and an overview of meal planning. I wish this cookbook had been around when I left home for the first time. Not kidding. I had way too many meals of canned soup and pizza in my early years. I had a hard time selecting which recipe I wanted to prepare from Kitchenability 101. The Chocolate-Drenched Marshmallow Brownies called my name early on (I started reading in the Party! section. Please, don’t judge). Then I found the Chili Burritos and remembered all the meals I ate out of a food cart in college. I almost picked the Strawberry Crepes because they use Nutella and I LOVE Nutella. 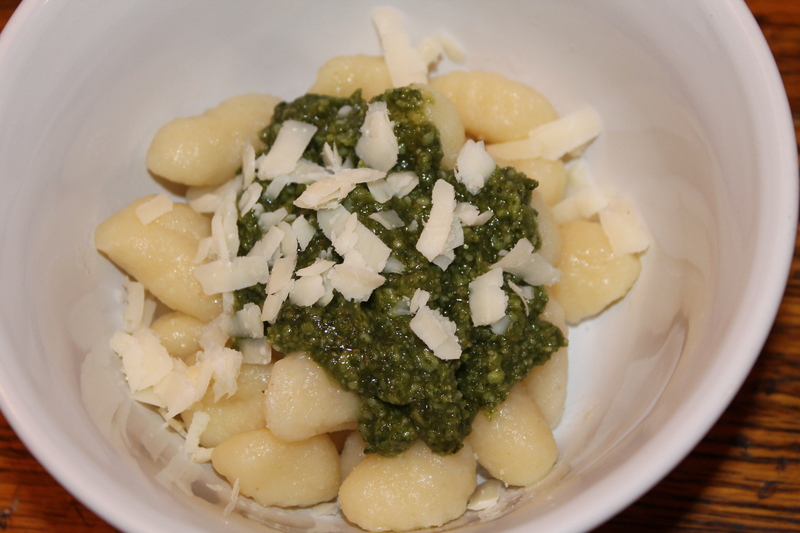 But, 30 minutes into my love obsession with this cookbook and its layout, I settled on Gnochi with Pesto. It’s simple. It’s elegant. And, Nisa Burns didn’t wimp out and tell you to grab a jar of your favorite pesto. It has a recipe for homemade pesto. Yum! For those who think a college student couldn’t afford this type of cuisine, the whole recipe cost me less than $25 and I had enough pesto for a whole package of gnocchi, a whole package of tortellini and I still have enough pesto for another box or two of pasta or gnocchi. I consider this very economical since pesto keeps well in the fridge and freezer! For $14.46 you can purchase this delightful book at Amazon. Please visit Nisa Burns’ Website. Note: PR by the Book graciously supplied me with a copy of Kitchenability 101: The College Student’s Guide to Easy, Healthy, and Delicious Food for review. No other compensation was received. The review in this post is honest and my own. Looking for some easy potato recipes? 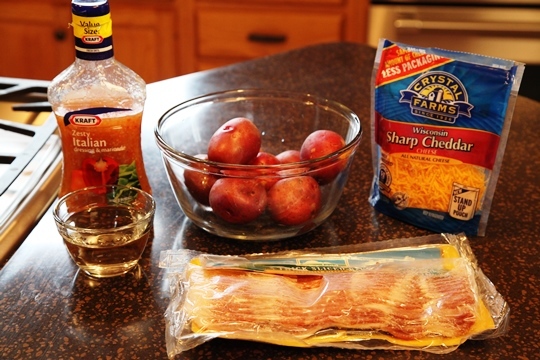 Potato Smashers are like Potato Skins, covered with crisp bacon and sharp cheddar cheese…but on a grander scale! You can make these in about 15 minutes and your family and friends will rave! Place potatoes and water in 2 quart microwavable bowl. Microwave, uncovered, om HIGH for 10 minutes or until potatoes are tender. Let stand a couple of minutes to cool slightly. Meanwhile, cook bacon in large skillet 8 minutes or so..until crisp, turning frequently. Drain on paper towels, leaving the grease in the skillet. 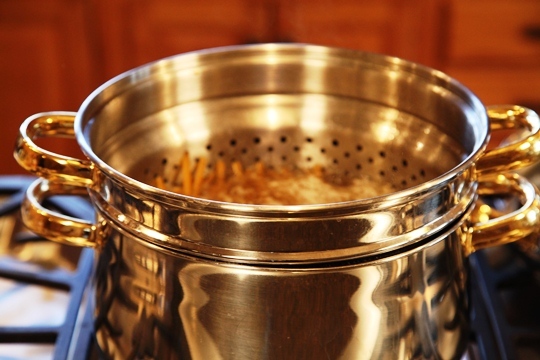 Drain the potatoes, press each potato with the bottom of a small bowl or saucer to flatten to ½ inch thickness. Heat Italian dressing in the skillet with the bacon grease. Add potatoes; cook 4 minutes or until bottoms are golden brown. Meanwhile, crumble bacon. Turn the potatoes over; sprinkle with the cheese and bacon. Cover skillet with lid and cook an additional 2 minutes or until the cheese is melted. 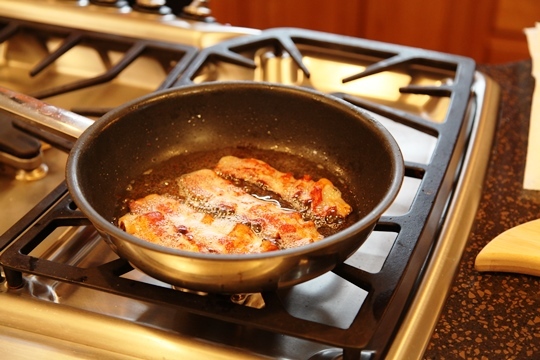 Cook the bacon…and save the grease! You are going to brown the cooked potatoes in that grease in a few minutes! Drain the potatoes and “smash” each one with the bottom of a small bowl or saucer..
Heat the dressing in a large skillet with the bacon grease..add the potatoes. 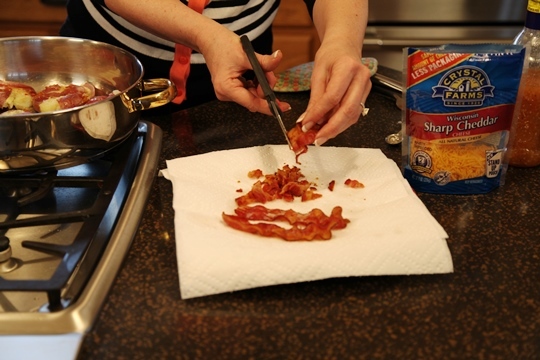 Use kitchen scissors to crumble the crisp bacon. Cook the potatoes 4 minutes or until the bottoms are golden brown. Turn the potatoes over. Top with bacon and cheese. This is one of my favorite potato recipes! 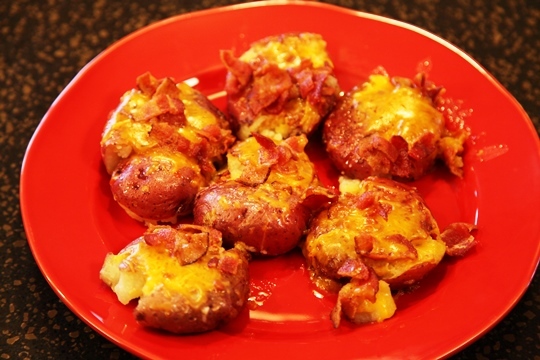 Potato Smashers are loaded with bacon and cheddar cheese. Make your life special by serving this Mimosa Recipe for a leisurely weekend breakfast…or Brunch…or for a Bridal Shower! I also love to serve these on Mother’s Day for an extra special treat. With warm weather just around the corner, I’m sure we will find lots of occasions to enjoy this festive drink! There are several ideas below that will take your Mimosas over the top. You can make these wonderful drinks in less than a minute! How easy is that! Just remember to use ice-cold Brut (Dry) Champagne for the perfect Mimosas. Mimosas are traditionally served in tall champagne flutes. Be sure to check out my money saving tips on buying champagne flutes and the wine in my Mimosa Recipe Video. I tell the story about a bridal shower I catered and I learned that you can entertain with class for not much cash! By using my success secrets, the bridal shower was a huge success and everyone enjoyed Mimosas. Fill champagne flute one half full with champagne. Fill the rest of the way with orange juice. Here are some “Make Life Special” extras that will take your Mimosas over the top! I love to serve this Mimosa recipe for a leisurely weekend breakfast…for brunch…or for a bridal shower. Let’s Make Life Special ! Savory Chunky Beef Stew for a Winter’s Night! 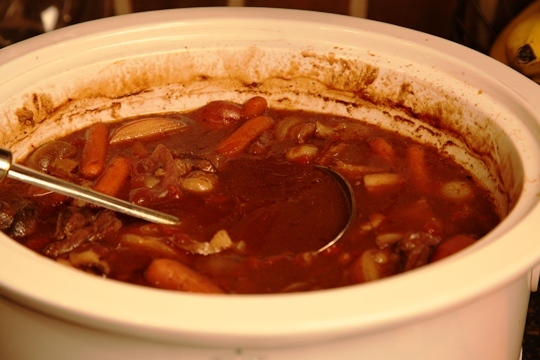 My Chunky Beef Stew goes together in a snap and your crock pot does the rest of the work! This stew is full of hearty beef chunks, bacon, potatoes, baby carrots, whole pearl onions and mushrooms and cooks up in a tomato and brown gravy sauce. This is sure to warm you up on a cold winter day! 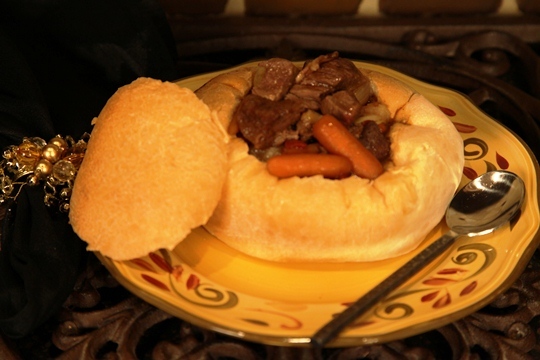 Here, I’ve served Chunky Beef Stew in my “Homemade” Bread Bowls that are made with frozen bread dough. Check out that recipe too! In medium skillet, cook the bacon ( I use kitchen scissors to cut it up quickly) and the beef stew meat until browned. Do not drain. 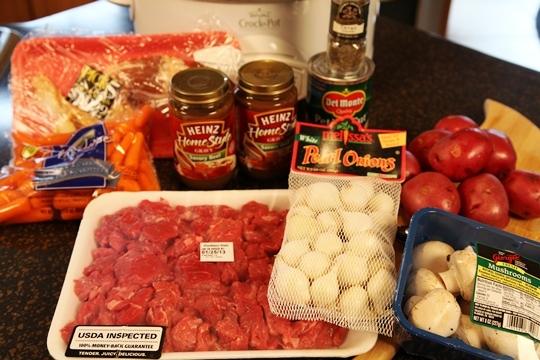 Combine the beef stew meat, bacon and liquid in the crock pot along with the rest of the ingredients. 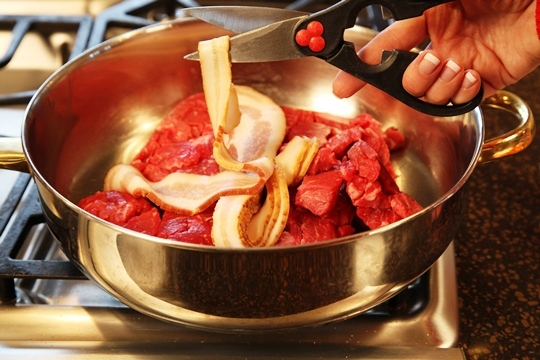 Success Secret: Use kitchen scissors to easily cut the meat into pieces! 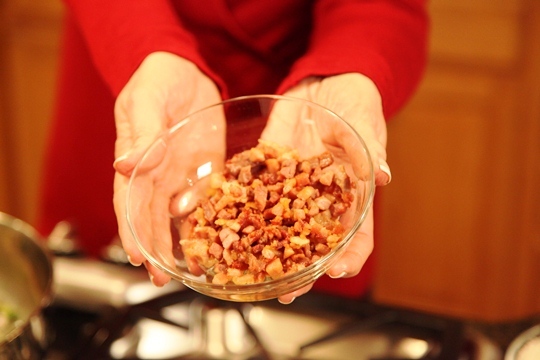 Use kitchen scissors to cut the bacon into pieces and then brown the bacon and stew meat in a skillet. 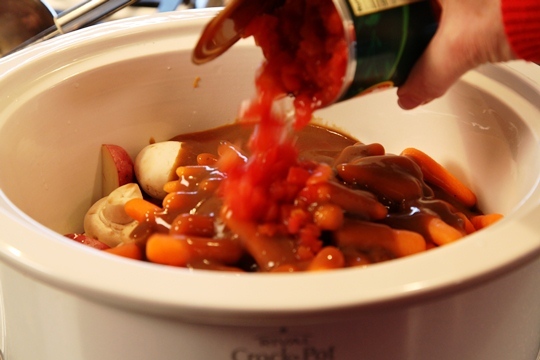 Add the browned meat along with the liquid from the skillet to a sprayed crock pot and add the remaining ingredients. Note: If you are using the pearl onions, boil them separately for about 3 minutes, cut off the ends and the skins should slide right off. The other option is to use 2 small onions and cut them into eights , however I really like the look of the pearl onions best. Now just set the crock pot on low and let it simmer away for 8 to 10 hours. 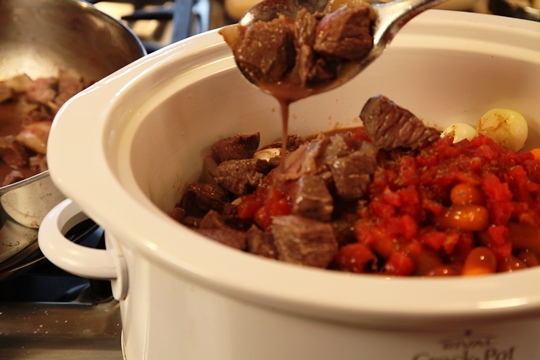 You won’t believe the aroma that will fill your kitchen as this stew cooks! If you don’t have 8 to 10 hours to let this cook on low…no worries! You can let it cook on high for 3 hours and then turn it to low for another 3 hours and that will work just fine. I made my EASY “Homemade” Bread Bowls to serve this stew in. 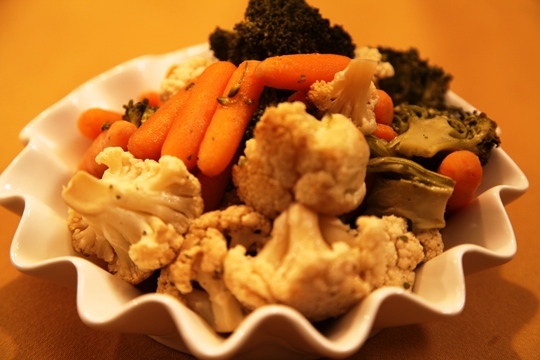 Try this crock pot recipe too! Remember….Let’s make life special by sharing great food with our family and friends! Enjoy! Looking for some baked potato bar ideas? 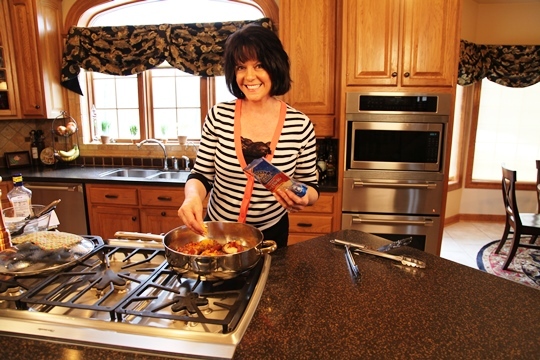 I recently posted baked potato bar ideas and how to bake the perfect baked potato. 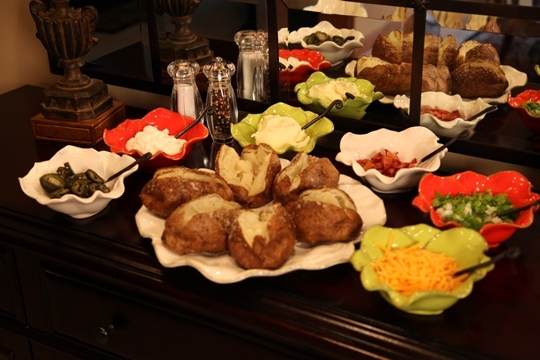 You can check out my post here: Perfect Baked Potatoes and a Baked Potato Bar. This is an easy way to entertain because your guests help themselves. The baked potato bar is great any time of year. It would be perfect at a BBQ on the patio or for a Super Bowl Party as suggested by Hickory Farms. It is fun to combine different options on the baked potato bar – depending on the season. 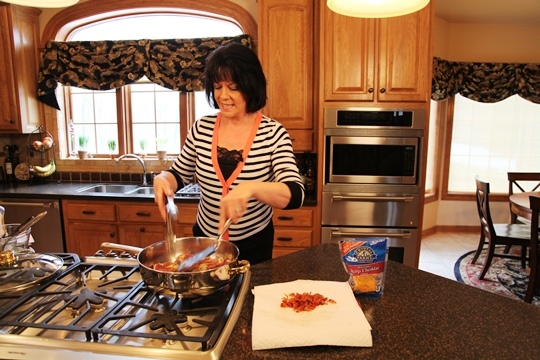 Add piping hot chili as a topper in the cold winter months. 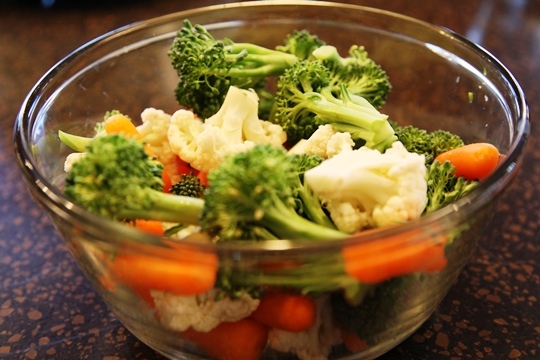 Add fresh chopped tomatoes or green onions when the garden is busting with fresh vegetables. 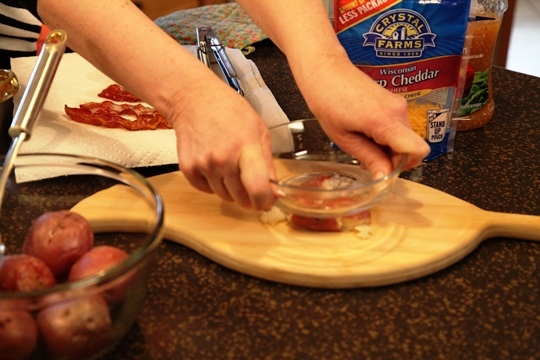 Hickory Farms suggested adding chopped summer sausage as a topper and I like that idea too. There are really countless options..just use your imagination for creative flavor combinations. My recipe for the perfect baked potato is also easy. You can bake as many potatoes as your oven will hold! I love to add the sea salt or kosher salt to the outside of the potato skin before baking because it adds a nice salty flavor and some crunch to the potato. And, potatoes are loaded with nutrition! 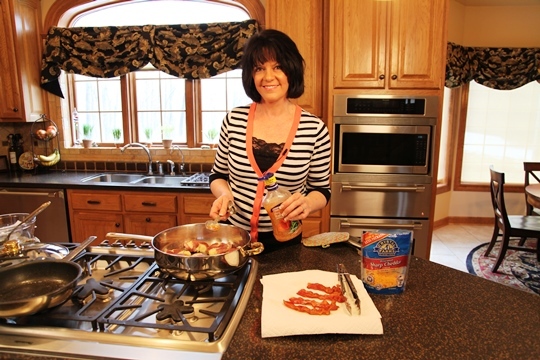 Hickory Farms just featured our Make Life Special Baked Potato Bar ideas in their “Winning Super Bowl Party Foods” post. In addition to the toppings I suggested, they added their chopped summer sausage — what a great idea! Thank you Hickory Farms for the great shout out! 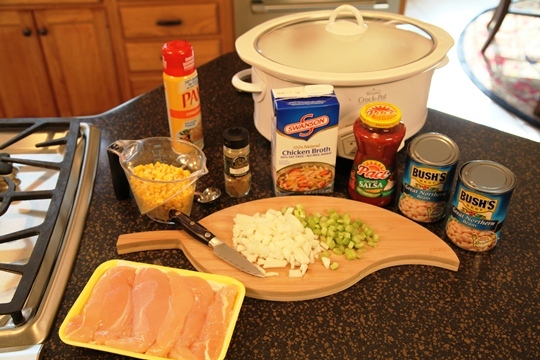 Crock Pot Southwestern Chicken Soup Recipe! 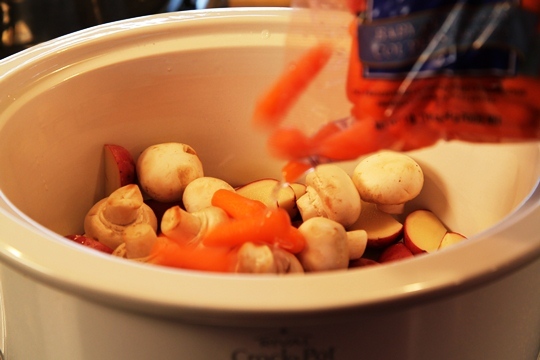 Looking for a crock pot chicken soup recipe? 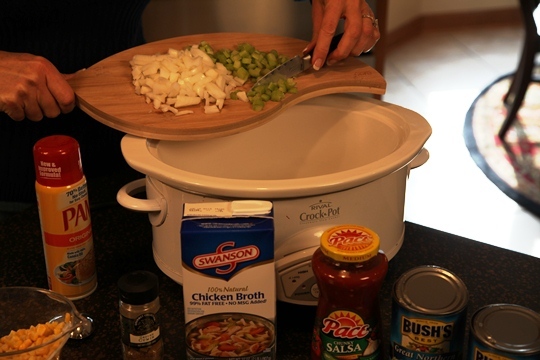 Soup’s on…and the crock pot does all of the work! This Southwestern Chicken Soup Recipe can be varied by using either Great Northern Beans ( as I have done here) OR Black Beans. There are several optional garnishes you can top this soup with: shredded cheddar cheese, chopped onions, chopped avocado, sour cream and/or a squeeze of fresh lime juice. Delicious! 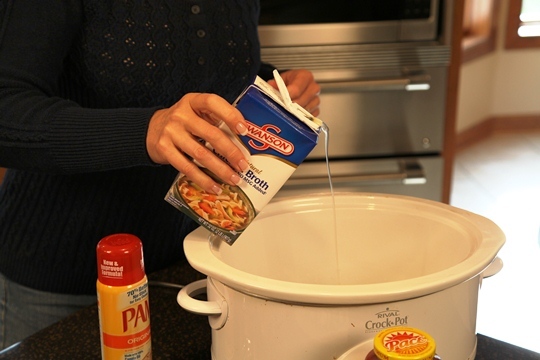 Spray a 4 quart or larger crock pot with cooking spray. 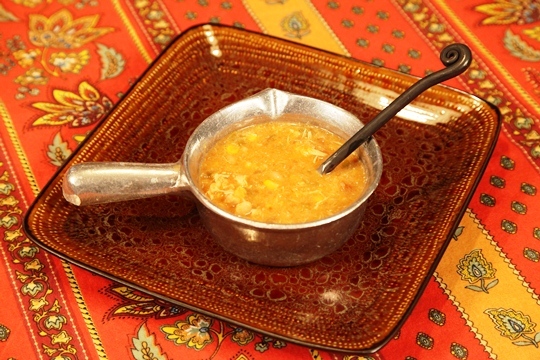 Combine the beans, chicken tenderloins, chicken broth, 1 cup of chopped vegetables, corn. salsa and cumin in the crock pot and cook on low for 6 to 8 hours or high for 4 to 5 hours. At the end of cooking time, use an immersible blender to blend a bit of the beans to thicken the broth. Stir in ½ cup of sour cream before serving. Set out the garnishes and let each person top their soup as desired. 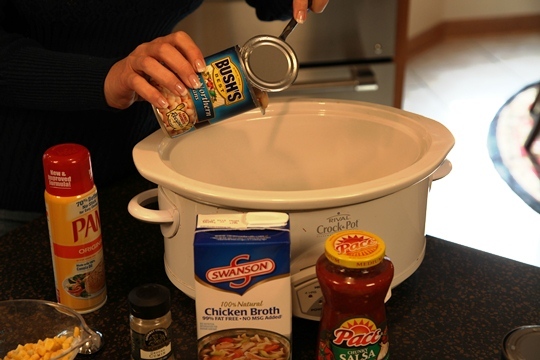 Spray the crock pot with cooking spray and add the soup ingredients. Cook on low for 6 to 8 hours or high for 4 to 5 hours. Use an immersible blender to blend a bit of the beans to thicken the broth. Need a new Crock Pot? 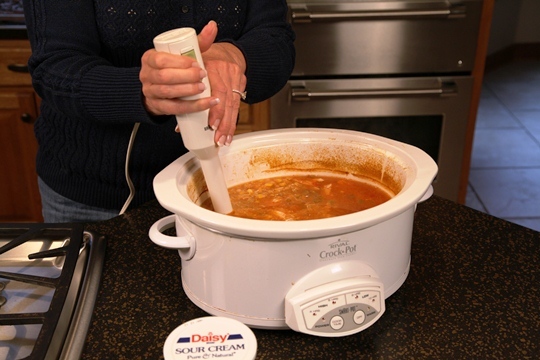 This 5-quart slow cooker has all the great features of a traditional Crock-Pot by Rival, only now it’s programmable so you can have meals ready when you are, right down to the hour or minute. Features three settings including Serve Setting which it automatically switches to when the set-time is up. Sure-grip handles ensure added comfort and control. 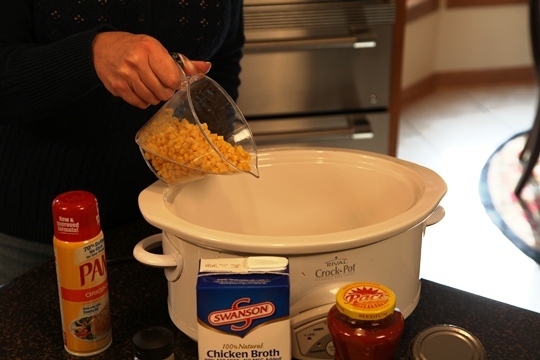 Stoneware crock removes for serving, and the Rinse-Clean interior makes doing the dishes a snap. 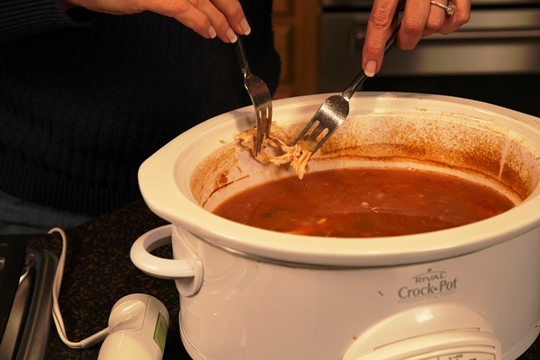 Be Sure To Try These Other Make Life Special Crock Pot Recipes! Remember…. Let’s make life special by sharing great food with our family and friends! Enjoy!! Risotto originated in Italy and is a rice dish that is cooked in broth to a creamy (dreamy!!) consistency. Risotto can be served as a first course – with some crusty bread – as we are doing here. As a first course, it is great paired with a Brut Champagne. Check out this great pairing at Velvet Palate. Risotto is typically cooked in a meat, fish or vegetable based broth. 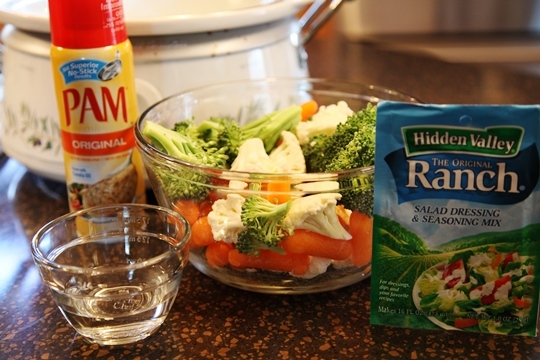 This recipe uses chicken broth ( low sodium) . 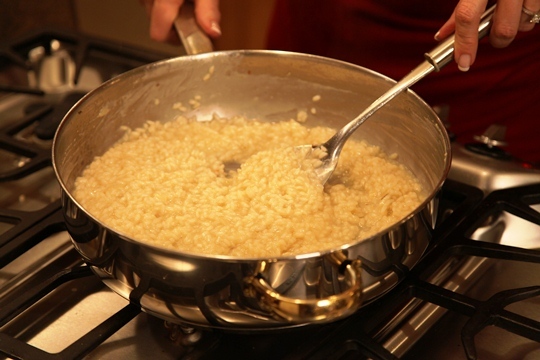 Many types of Risotto contain Parmesan cheese, butter and onion. 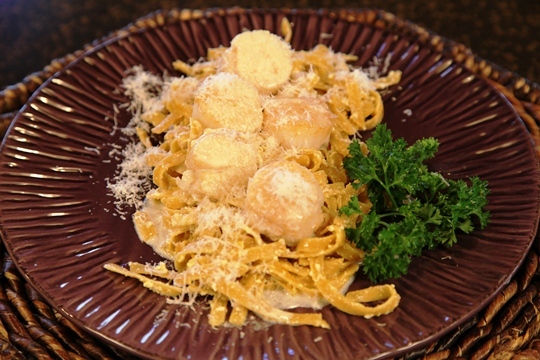 This recipe uses Parmesan cheese, butter and shallots. Then we ramp it up to robust by adding 1/4 pound diced asparagus, 1/4 pound sliced shiitake mushrooms and Prosciutto (which is a type of Italian bacon). You have to use a high starch rice to make risotto and this recipe uses Arborio Rice. This type of rice has the ability to absorb liquids and to release starch and so it is stickier than the long grain rice varieties. 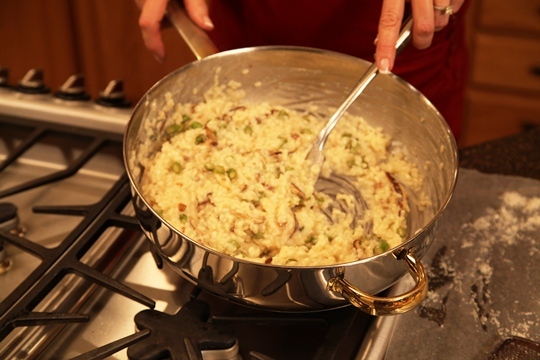 While there are many variations on Risotto, the basic preparation remains the same. 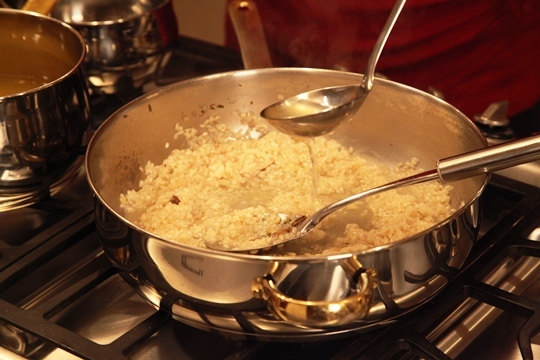 The rice is first cooked in onion ( or shallots ) and butter or olive oil to coat each grain in a film of fat. Then, red or white wine is added and has to be absorbed by the grains. This recipe uses white wine. When the wine is absorbed, the heat is raised to medium and very hot stock ( I used chicken stock in this recipe) is added in small amounts while stirring gently, almost constantly ( this process is what creates the smooth creamy-textured liquid). 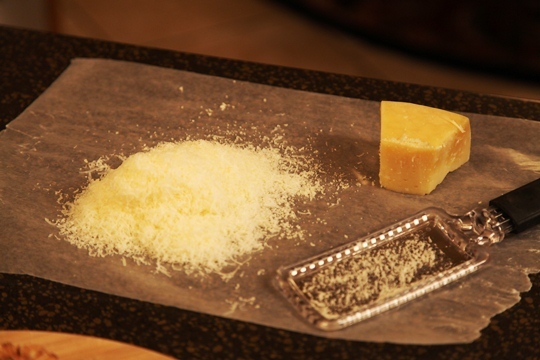 At this point, it is removed from the heat and the finely grated Parmigiano-Reggiano cheese is vigorously stirred in to make the texture as creamy and smooth as possible. This recipe adds the cooked asparagus and mushrooms at this point and is then topped with the scrumptious cooked prosciutto for a robust and over the top risotto! Simmer the broht in a saucepan. Keep warm. 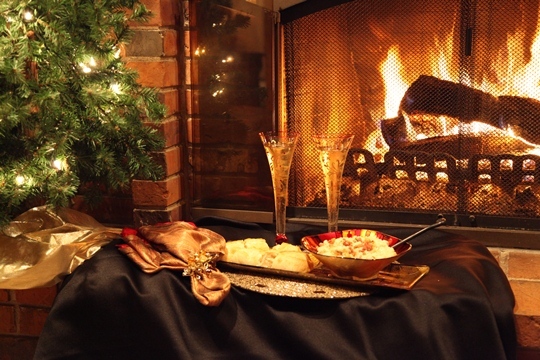 Heat the wine in a separate saucepan and keep warm. 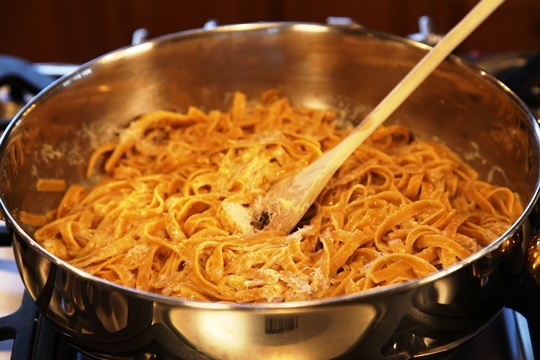 Add 1 tablespoon olive oil to large pan and heat. Saute the prosciutto for 3 to 5 minutes or until tender. Remove from skillet and set aside. Add the asparagus and saute 2 minutes. As they begin to get tender, add the sliced mushroom and cook an additional 3 minutes or until the vegetables are tender and the liquid is removed. ( do not include any of this liquid or the risotto will not be creamy!). Remove from skillet and set aside. Add the additional 1 tablesppon of olive oil to the skillet and sweat the shallots and garlic until translucent, about 3 minutes. Stir in the DRY rice and saute until each grain is coated in oil. 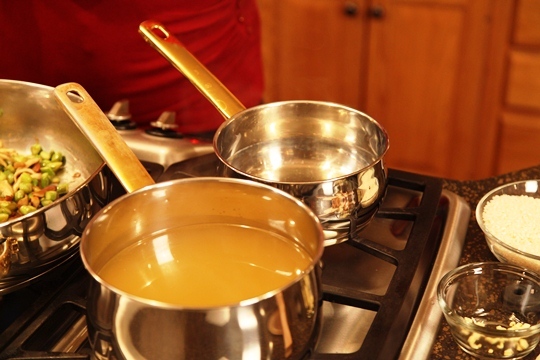 Deglaze the pan with the warm white wine and stir until completely absorbed, 1 to 2 minutes. Now, start adding the hot broth to the pan in ½ cup increments; simmer and stir frequently until each addition is almost completely absorbed before adding the next, about 45 minutes total. Lastly, stir in the cooked asparagus, mushrooms and the grated Parmigiano-Reggiano cheese. Season with salt and pepper, top with cooked prosciutto. 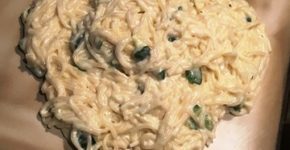 Be sure to check out Nicole’s Mushroom Risotto which is a more delicate risotto recipe with a creamy cheesy texture. 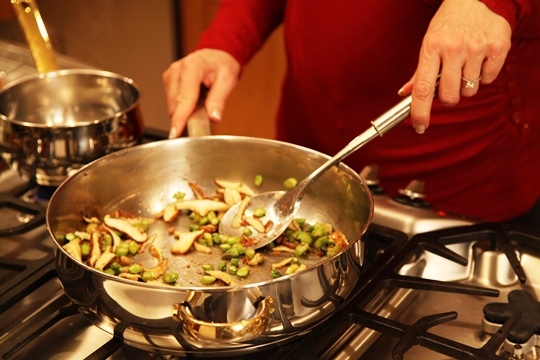 Saute the asparagus and then add the mushrooms…. Ingredients ready to add to the Risotto mixture…. 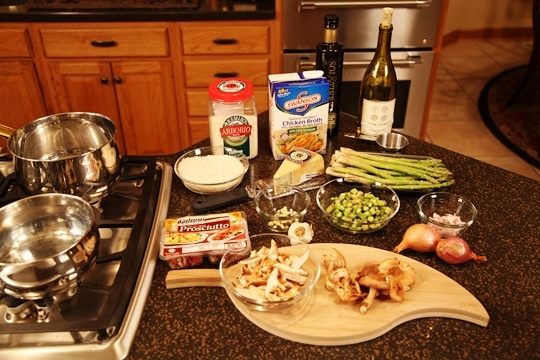 Stir in the cheese, asparagus and mushrooms…. Risotto is great to serve as a first course with crusty bread or as a side dish with pork.